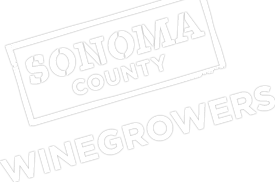 Sonoma County, Calif. (August 8, 2016)—Sonoma County Winegrowers are excited to announce the start of the 2016 harvest with Pinot Gris and Chardonnay grapes picked last Monday, August 1 in the Russian River Valley by J. Vineyards & Winery. That was followed-up with Sonoma Valley’s Gloria Ferrer Caves & Vineyards picking their first fruit of the season on Wednesday, August 3 -Pinot Noir from their Home Ranch. In addition, Iron Horse Vineyards in the Green Valley of the Russian River Valley also started their 2016 harvest on Thursday, August 4. All three will use these grapes for their sparkling wine programs. Harvest for still wines also started last Friday with Martinelli Winery picking Chardonnay from their Woolsey Road Vineyard for a Ramey Wine Cellars bottling. The 2016 harvest continues the trend in recent years for an earlier than normal start to harvest, arriving just 4 days later than 2015’s first pick that started on July 29. The 2014 harvest also started early on July 30. Over the next few weeks, Sonoma County will see continued harvest activities as more fruit for sparkling wines and still white wines, like Chardonnay and Sauvignon, are picked and brought into wineries. Harvest for red still wines such as Cabernet Sauvignon, Merlot, Syrah, Pinot Noir, and Zinfandel is not expected to begin until later this month and be completed in late October. Generous winter rains and moderate temperatures have given Sonoma County winegrowers an optimistic outlook that this year’s harvest will be a superior vintage with high quality fruit being produced throughout the region. Sonoma County had large bumper crops in 2013 and 2014 while 2015 produced a smaller crop. All indications so far this year indicate the crop will likely be average in volume and size for Sonoma County. This season, the region received 30-42 inches of rainfall which was a normal rainfall season. The rainfall was balanced and consistent throughout the winter and spring time which kept the soil moist throughout the growing season. This has helped replenish the root zones, while also recharging the aquifers and filling up reservoirs on our vineyard properties. The rainfall also helped spur a lot of growth on the vines earlier this spring, which is a good sign of healthy vines. As expected vine growth started to slow down as summer progressed with warmer temperatures. With veraison occurring at different stages throughout the region and fruit starting to be picked for still wines, Sonoma County is well on its way for another busy harvest season this fall. Want up-to-the-minute updates on Sonoma County’s harvest activities directly from our grape growers and wineries? Back by popular demand, the Sonoma County Winegrowers have created an online Harvest Tracker to help everyone stay informed on what’s happening in our vineyards and cellars. Visit www.sonomawinegrape.org/harvest for the latest news.